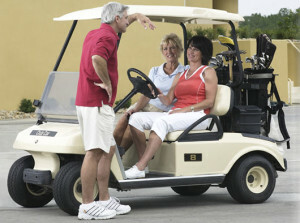 Cypress Lakes ranks among the finest golf communities for adults 55 and over in Central Florida. Our Big Cypress Golf & Country Club features two 18-hole courses that offer something for players of every skill level, from low- to high-handicap golfers to those brand new to the game. The North Executive Course is a 3,494-yard par 60 layout designed by renowned golf course architect Chip Powell, while the South Championship Course is a -6,680-yard, par 72 track that has received favorable mentions in Golf Digest, Florida Golfer, and Senior Golfer. As golf communities in Central Florida go, Cypress Lakes is unquestionably one of the best. In 2014, the greens on the South Championship Course were re-sodded using the highly regarded Diamond Zoysia turf, a revolutionary variety of Zoysia that is resistant to the shade cast by our many towering cypress trees. Another way in which Cypress Lakes stands out from among the many other golf communities in Central FL is the passion, professionalism, friendliness, and service-orientation of our golf facilities staff. Scott Yates, a 20-year PGA member, is our head golf professional and an individual who consistently provides the highest level of service and golf instruction, always with an emphasis on making the game of golf fun. Our golf course superintendent is Gary Newcomb, a GCSAA-certified Florida native who excels at keeping both courses in splendid playing condition. We are fortunate to have professionals like these on our staff and value the many contributions that they make to our wonderful golf community. Come see for yourself what makes Cypress Lakes one of the top golf communities in all of Central Florida. Through our popular Stay & Play program, you’ll have the opportunity to experience the Cypress Lakes lifestyle over the course of a three-day, two-night stay in a delightful guest home with full access to all of our recreational and social amenities. Contact us today to schedule your visit and to learn more about how we compare to other Central FL golf communities.